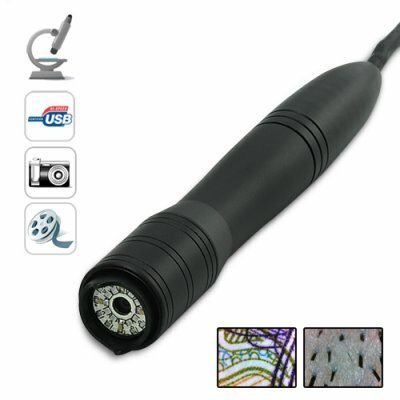 Successfully Added 2.0MP High Definition USB Digital Microscope (200x, 4 LEDs) to your Shopping Cart. Discover a hidden microscopic world with this high definition USB digital microscope. This USB Digital Microscope allows you to capture incredibly detailed images or video and display them on your PC using a simple USB connection. View specimens collected around the house, backyard, or the fridge. Look at the hidden micro-printing on a dollar bill or examine the traces on your electronic components. Ever wondered what your skin really looks like or the mold growing on your three week-old bread? Now you can find out with this amazing USB digital microscope! This USB digital microscope provides you with an easy way to magnify objects up to 200 times their original size and features four adjustable bright white LED lights. This allows you to see even the smallest of details, in high definition, directly on your computer screen. Details like the individual cotton strands on clothing or even the fine scratches on a collectible coin that would be impossible to detect with the naked eye, can easily be viewed by this amazing USB digital microscope. With the included software you can even save your images directly to your hard drive in .JPG files, or 640x480 30FPS video files for sharing with your friends, family, boss or client. The software also comes with image controls for color, hue, brightness and contrast-- allowing you to maximize the clarity and detail of your image in real time. If you’re a professional user then you’ll be happy to know that this software will even display a measurement scale to determine the exact size of the objects you are viewing for accurate appraisals or damage assessment. Use this device for examining fine jewelry, skin, hair, coins, electronics, or simply use it to have a little fun. Have you ever seen the surface of your skin under a high powered microscope? It’s pretty scary-- but pretty amazing at the same time. What’s even more amazing is that while similar microscopes sell for over $150 on Amazon and eBay, Chinavasion offers you the same product for much less. And unlike most products you find online, ours is actually backed by a one year guarantee and is in stock in our warehouse right now and ready to ship. Order today and we will express ship your order by tomorrow. This digital microscope is very easy to use. Even children can have fun using it! Simply install the included software CD on your computer then plug the microscope into any USB port then place the microscope over an object of your desire. The closer you place it the closer your image will appear. Open the software program to view a real-time image of your object and use the rotating end piece of the microscope to adjust the focus of your image. Can I use this with my Linux or MAC computer?